Israeli modular mobile manufacturer Modu has announced that it is the proud producer of the world’s lightest mobile phone – weighing in at a featherweight 1.41 ounces. The press release just informs us that: “Modu was awarded this prestigious honour after careful consideration by the Guinness World Record judges, who declared that: 'The lightest mobile phone is the Modu, which weighs 40.1g (1.41oz)'”. 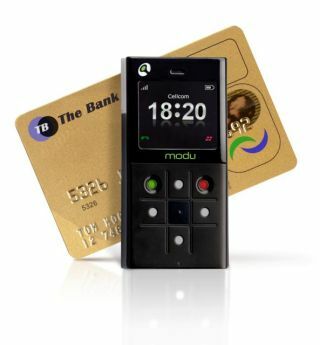 You may remember that Modu launched its quirky and ‘modular’ mobile at last month’s Mobile World Congress (MWC) event in Barcelona, Spain in February 2008. “Throughout the design process of Modu, the emphasis has been on keeping the phone small, light and compact in order that Modu’s innovative approach could be realized. The result is a phone that is not only miniature, but also superbly designed and minimalist, whilst offering all the functions and capabilities of a normal-sized handset,” the release continues. Zack Weisfeld, Modu’s vice president of marketing, added: “With Modu, the mobile phone can now be added to the list of ‘invisible’ items that people carry with them wherever they go, such as a bunch of keys, their wallet and their watch. Modu’s partners to date include: Bee-Line (VimpelCom), Cellcom, Telecom Italia, Blaupunkt, Magellan Navigation Inc, SanDisk, Card Guard, Tele Atlas, Universal Music Group, WorldMate, Amphenol, ChiMei, In4Tel, Texas Instruments, Renesas, RiTdisplay, SKY MobileMedia and Varta.